I found myself with a craving for meatballs this weekend, but not just any ordianry meatballs. I wanted something with some flair, with big robust flavours, something a little more exoctic then the tried & true, pasta & meatballs. As I was contemplating my craving when I noticed my Tagine in the pantry and had a total ureka moment! Morcocan meatballs would be exotic, would definitely have robust flavours, and definitely wasn’t pasta & meatballs. After a quick search through my cookbooks, I settled on meatball in a spicy tomato sauce recipe. * Moroccan Spice Blend – sesame seeds, thyme, sumac, lemon peel, oregano, basil, majoram, seat salt. I bought my spice blend at my local spice shop. 1 14oz can diced tomatoes drained. In a bowl combine beef, bread crumbs, onion, garlic, spice blend, egg, & salt. Sccop ouf 1-2 tbsp of of beef mixture and roll into meatballs between your palms. 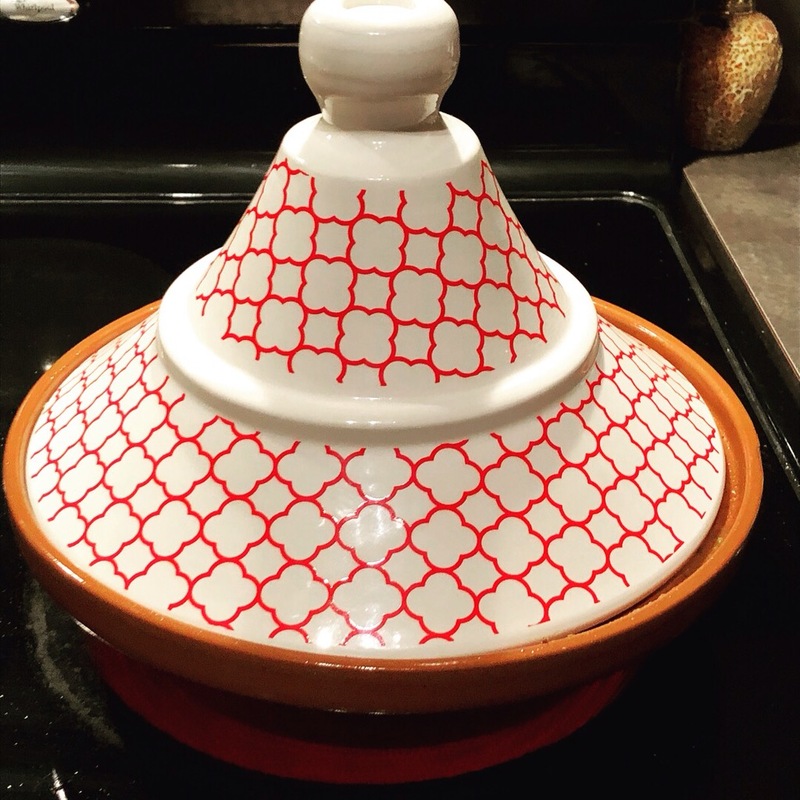 In the bottom of flameproof tagine or heavy bottomed pan heat olive oil over medium heat. Add the onion and spice blend and cook, stirring for 3-5 minutes or until onion softens. Add garlic, chili, and ginger and cook, stirring for 5 minutes or until vegetables are soft. Add tomatoes, lemon juice, lemon zest and bring to boil. Reduce heat and simmer, stirring occasionally, uncovered, for 10 minutes. Add spinach and cook just until it begins to wilt. Place meatballs in the sauce and turn the heat to low. Put the tagine lid on and simmer the meatballs for 15 – 20 mins turning them every 5 mins or so. Serve alongside your favourite starch & enjoy! 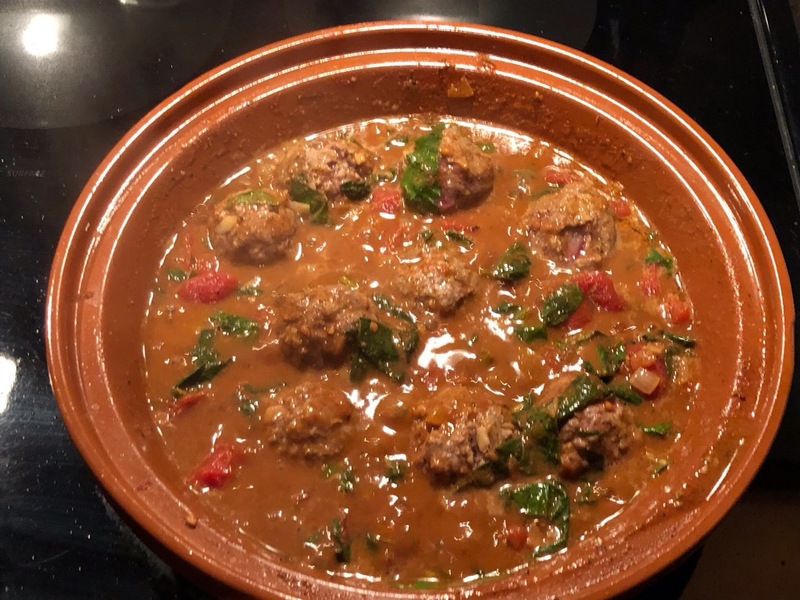 Posted on January 22, 2018 by Les BrownPosted in FoodTagged Foodie, gourmand, Gourmet, ground beef, home cooking, Homemade, Meatballs, Morocco, saturday night feast, spice, spiced kefta, Spinach, tagine, Tomato, wine & food, wine pairing.